Seems like everyone is still on the kick on eating healthy this year. I have been trying to add more raw veggies into my diet. This asparagus salad has become a favorite in my house. Not only does it look beautiful, but it tastes amazing and refreshing. The salad goes great with a side of homemade soup. You can top also it with pretty much anything. 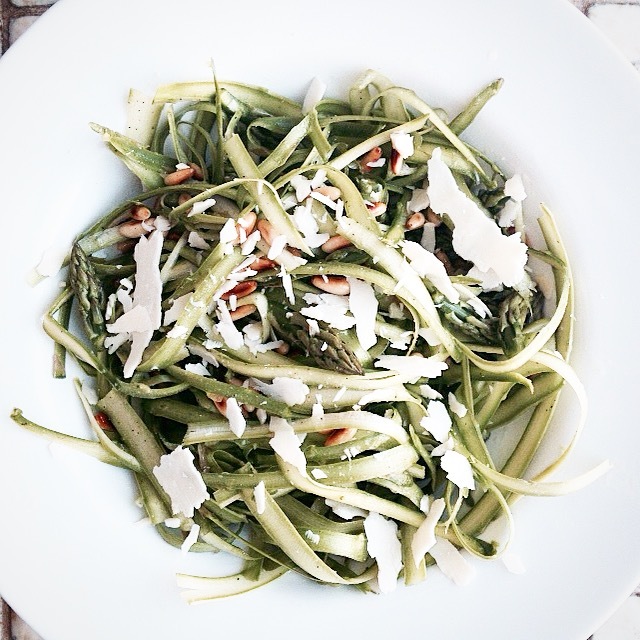 I used shaved parmesan and toasted pine nuts. Enjoy! Take 1 asparagus spear at a time, use a vegetable peeler to shave spears into long, thin ribbons. Add ribbons to a medium bowl. Next add pine nuts, olive oil, s&p and lemon juice. Toss together place on serving dish and top with shaved Parmesan cheese. I always cook my asparagus. This looks yummy….definitely going to try it raw 🙂 Thanks for sharing! I’m always looking for a new salad, and this is one I’m anxious to try. Simple, quick and yummy – this one looks like a winner, thanks for sharing! That looks gorgeous; I’d quite like to treat myself to some! Those are great ingredients – I do enjoy asparagus!